Passware pioneers in acquiring data from Microsoft OneDrive. Access to OneDrive is provided either if the user password is known or by extracting an authentication token from the target computer memory or a hibernation file. This token allows further downloading of the full user's OneDrive storage: documents, photos, videos, etc. Passware Kit now extracts data from Windows Phone physical images. This data may include Live ID accounts, website logins, and other credentials. 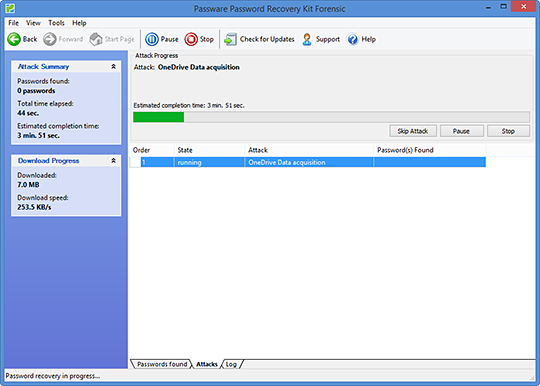 Passware Kit is the first and only password recovery software that supports the new TACC2 hadrware acceleration appliance by Guidance Software. 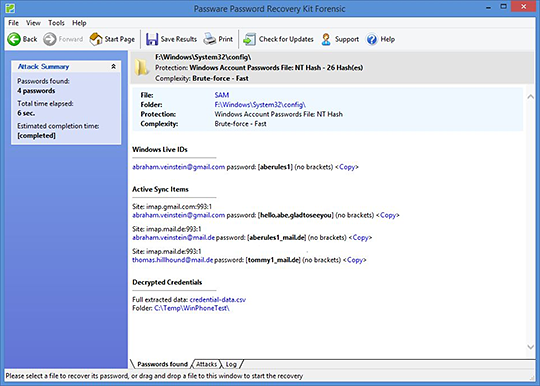 TACC2 speeds up the password recovery processes by up to 30 times for: MS Office files, PGP disk images, Zip and RAR archives, Mac Keychain, Android backups and images, Apple disk images and iTunes backups. NOTE: This feature is available in the Passware Kit Enterprise and Forensic editions only. For more information on the TACC2 appliance, contact Guidance Software.